The HyLoft multi-tire rack storage rack is a great solution for storing seasonal tires, recreational tires or track tires and wheels. The installation is simple. The black master rail attaches to wall studs of finished or unfinished walls and the black rack clips in to the master rail. 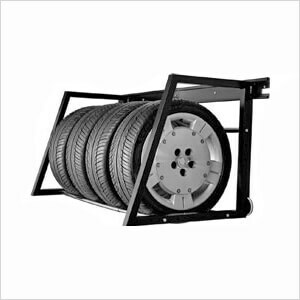 The multi-tire rack accommodates various tire sizes as the chrome telescoping support bars adjust in width and depth. 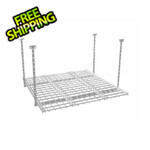 The load capacity is 400 lbs.